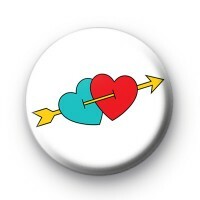 This white 1 inch metal pin badge has two hearts one blue one red with cupids arrow through them. Have you found Mr or Mrs Right and are celebrating your love this Valentine's Day, if so our fun love, romance and heart themed badges would make the sweetest handmade tokens of love. This is the perfect badge for lovers and hopeless romantics, it is a nice simple design and would look nice pinned to your bag or coat, or used in your handmade Valentine's crafts.